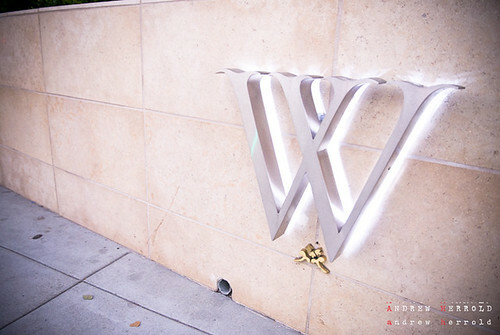 It’s a restaurant in Beverly Hills with Wolfgang’s name on it. And you would be sorely mistaken to think it were that Wolfgang – because it’s not. Zwiener, who is the former famed head waiter at New York’s Peter Luger Steakhouse, had built an identity and following of his own on that coast – and due to that demand extended his Wolfgang’s Steakhouse outpost to Canon Drive last year (much to Puck’s chagrin). Having never eaten there, I was lucky enough to be invited to a media happy hour as a warm-up. I’ll have to revisit to give their steak a fair shot since the “warm-up” was done quite well. Their cocktails have range, if a bit novel. But for the most part they are good. I started off with their oyster shooter – or what they call Absolute Oyster Shooter, with fresh blue point oyster, Absolut Vodka, horseradish and cocktail sauce. The only problem is that it’s done in a martini glass and there is no “shooting” about it. To get to the oyster I had to skim what heavy-hitting vodka lay on top and was tired of the drink by the time I got to the oyster and cocktail sauce that was on the bottom. 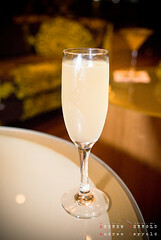 A thoughtful champagne spritzer cocktail called Birthday Cake was refreshing, light and a touch sweet – and deceptive because despite its name could easily be enjoyed as a non-dessert. Made with Grey Goose Citron, Frangelico and limoncello – it was probably the first time I had thoroughly enjoyed limoncello in a specialty cocktail if because only a touch was used (yes – even in romantic settings like the Amalfi Coast). 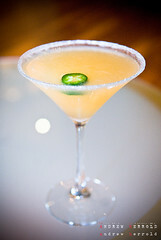 My favorite cocktail of the night, called Sunset,Â had a bit of a personal trump card – a jalapeno slice for its garnish. It was perfectly spicy and drinkable yet interesting. It’s made with Don Julio Blanco, orange juice and a touch of grenadine (they should probably mention the jalapeno in the menu). As for the appetizers – they saved the ground-breaking to others but what they stuck to, they did well. 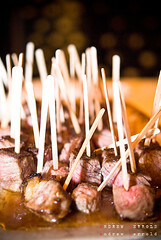 Thankfully, the steak skewers were done perfectly (well – they are a steakhouse) and just the right amount of pink in the center despite their less-than-bite size. The cheeseburger sliders were juicy, tasty and also the required pink in the center but a variation on that were the lobster sliders (pictured above). If a bit reminiscent of crab salad – just done with lobster instead – they were even crunchier, delicious and perfect for small bites. The tuna tartar, served on spoons, was seasoned just a touch and not overdone. It was good to taste the finely diced fish for what it was and not what magical mixture it could be made into. 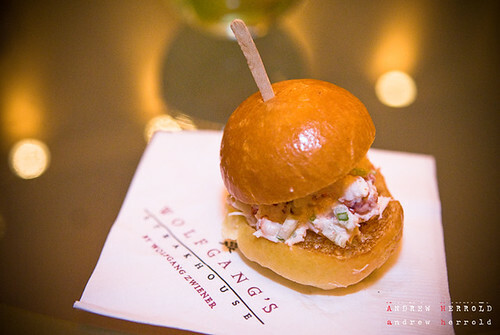 Wolfgang’s Steakhouse, nor Beverly Hills, isn’t in an area where I’d normally “cruise” for post-work relief – but it’s definitely a worthy destination. It’s high end and conservative (don’t come here for the atmosphere, hipsters), yet pleasant. There’s a nearby public parking lot that’s free for two hours and combined with their reasonable happy hour, you can brush shoulders with high-rollers and tourists alike without breaking the bank. The cocktails will keep you interested, lubricated and the bites happy and whet for dinner. This entry was posted in Beverly Hills, Food, Happy hour and tagged Beverly Hills, Canon, Happy hour, Lobster sliders, Wolfgang Zwiener, Wolfgang's Steakhouse. Bookmark the permalink.